← Are Men More Focused Than Women on Work Fashion ? 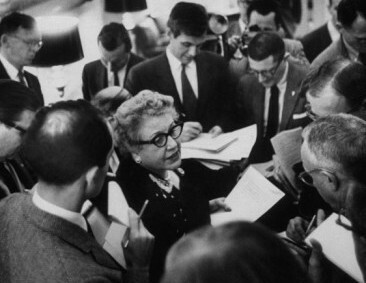 Between 1900 and the 1970’s, public relations was primarily an all-male field. But in recent decades women PR practitioners have been in the gender majority, with nearly two-thirds of the field now female. PRofessional Solutions is a woman owned PR staffing firm so in honor of National Women’s History Month, we salute public relations trailblazer ANNE WILLIAMS WHEATON. Wheaton, the first woman to serve as White House associate press secretary, was appointed to the post by President Eisenhower in 1957. Prior to this, Wheaton was the director of publicity for the Republican National Committee for nearly 20 years. She served as director of the League of Women Voters for six years. Her early career included public relations positions for several national women’s organizations. She got her start as a reporter for the Albany Knickerbocker Press. This entry was posted in PRofessional Solutions News and tagged women trailblazers in public relations. Bookmark the permalink.